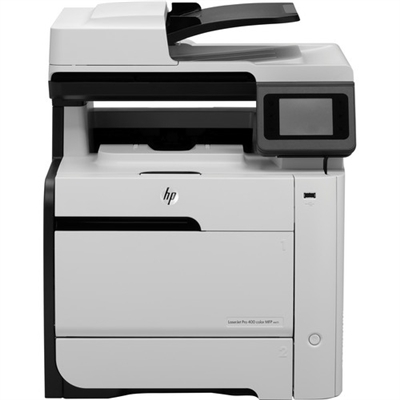 Meet your everyday document needs quickly and efficiently with the HP Color LaserJet m475dn Multifunction Color Laser Printer. The LaserJet Pro 400 M475dn Network Color All-in-One Laser Printer from HP prints, scans, copies, and faxes all in a compact unit designed to conserve space. The printer features a fast 21ppm in both black and color with 2 input bins (300-page total capacity) designed for printing larger jobs uninterrupted. Additionally, the 2nd tray can be used for another commonly used paper to save the hassle of constantly swapping media. The M475dn features a 50-page duplex auto document feeder that simplifies copying, scanning, and faxing multipage 1- and 2-sided documents. The ADF also makes it easy to scan, fax, and copy legal sized documents. Easily turn your office into a paperless environment by scanning your documents and saving them on the computer instead of keeping papers lying around.